Probably the most beautiful S.T. Dupont Jeroboam table lighter ever, finished in gold with Chinese Lacquer and gold powder. Named after the 3 liters Jéroboam Champagne bottle, S.T.Dupont Jéroboam table lighter gives the same long-lasting, exclusive pleasure. Its measures are just impressive: 110 x 72 x 26mm / 4.33 in x 2.83 in x 1.02 in and a weight of 640 g / 22.57 oz. The top of the line of the entire S.T.Dupont's production and a real piece of art, discontinued in the late 1990's and completely sold out. 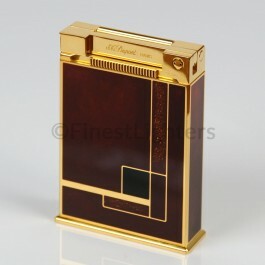 A great piece to add to any S.T.Dupont collection, impossible to find in brand new condition. The lighter comes with its original box and paperwork.